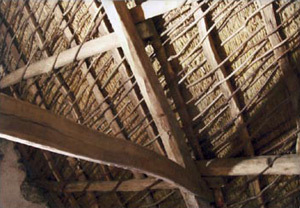 Historical Roofs, re-thatching of a traditional Welsh longhouse in Carmarthenshire, west Wales. 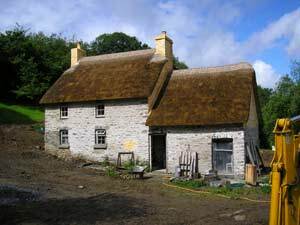 Traditional Welsh Cottage in Carmarthenshire. 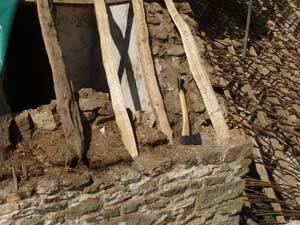 Restoration is possible even when things look bad as shown when the old tin on this Carmarthenshire dwelling is taken off to reveal a bit of a mess! 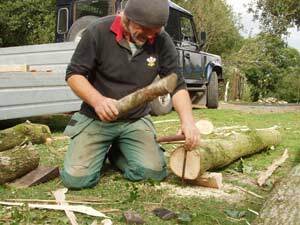 The owners wanted a minimum invasive repair of the roof so I simply removed the unusable timbers and then split local oak to reproduce the same style of timbers originally used. 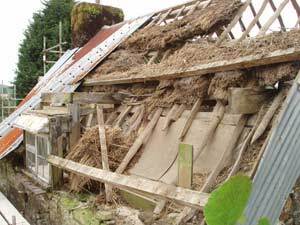 A hazel wattle in situ between the rafters was applied, then a new layer of wheat straw on top, it just goes to show what it is possible to restore if there is the will and expertise available. 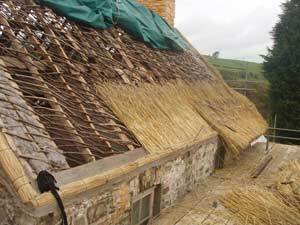 When this layer of thatch (the new weathering coat) wears back to the fixings it will then become an under layer (base coat) that a new layer can be fixed on 'top of' (thicker thatch and even warmer) preserving the beautiful view from inside for future generations. The whole building has bean lovingly repaired with lime mortar creating a breathing building, a real credit to the owners.